We all know the Easter tradition, the one that has kids bouncing on your bed at 6:00 AM, bright-eyed and ready to see what the giant gift-giving bunny left behind. The Easter egg hunt is a beloved activity, but to avoid any and all signs of boredom, you might want to try something new this year! The following ideas can be fun for any age (yes, even adult-age!) but we’ve also arranged them in a suggestive order. The ideas begin as suitable for younger children and are gradually more suitable for older children. 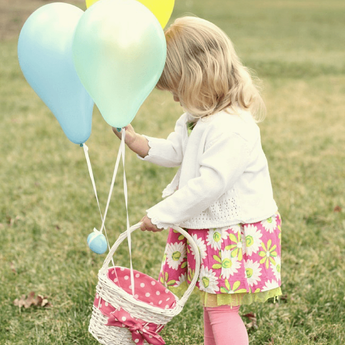 For very young children, the idea of tying balloons to the eggs they’re hunting for is genius! Watch them hop around the house or yard spotting balloons and finding the attached treasures. They'll have double the fun with treats and balloons to play with. If you’re looking for a way to minimize the sugar intake, this spin on a classic Easter egg hunt is just what you need! Instead of filling all the plastic Easter eggs with treats, fill them with “tokens” (tokens can be pieces of paper with the word “yolk” on them for fun). Once your hunters have gathered enough “yolks,” they can cash them in for prizes you’ve set out. You might have a book that “costs 5 yolks” or a pack of stickers for “2 yolks”. Watch on as they set out with determination to earn enough yolks for what they want. 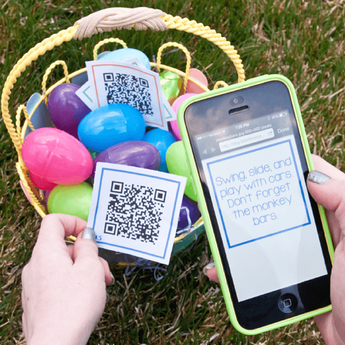 It’s easy to add some interest to your egg hunt tradition with a printer and some creativity. Along with snacks of choice, slip a piece of paper into each plastic Easter egg that has a fun activity written on it. With things like “do a somersault”, “quack like a duck,” or “act like Dad,” you’ve found a way to sneak in some physical activity, new skill practice, and certainly a lot of laughs! This idea can still work for younger children, but they may need a little reading help. Are your kids at the stage where they’re beginning to question the very existence of the elusive Easter bunny? You’d love for them to get into the spirit, but they’re glued to their devices? Aha! We have a suggestion for you. This tech-savvy scavenger hunt is done by printing clues as “QR codes” and downloading a free app to scan QR codes on a smartphone. Smartphones in hand, your kids will find hidden QR coded clues. Next, they scan the clue with the app and the clue will be revealed, guiding them to their next clue or treats to be discovered! There are Easter egg hunts, and there are scavenger hunts – why are we not having Easter egg scavenger hunts!? If your kids are getting a little older, you may need to add a little pizzazz to engage participation. A scavenger hunt allows you to turn things up a notch; you can use riddles and clues to lead your littles through a maze to uncover treats left behind by the Easter bunny. Consider printing out some bunny footprints to lay out for authenticity. Who says we have to wait until morning to have an easter egg hunt? Turn off the lights for a dark twist this Easter! And no, the dark twist is not listening as your kids bump and fumble in the night. We’re talking about using glow in the dark Eastereggs! As long as your children are old enough to participate safely, the challenge of spotting glowing neon eggs can bring the thrill back into the classic tradition. And check it twice! This Easter egg hunt is a little bit more challenging, perfect for kids who seem to have memorized all your best hiding spots. By creating an “Easter egg hunt checklist”, you can give specific instructions for what they’re required to find. For example, they may need to track down an egg of every colour, or things outside like a leaf, a twig, and a rock. As long as its safe within your home and yard, you can get creative – you may even want to have a final prize for those who can check off their entire list. A tradition is a lovely way to spend quality time with loved ones and celebrate what you believe in – but that doesn't necessarily mean it has to be the same, year after year! 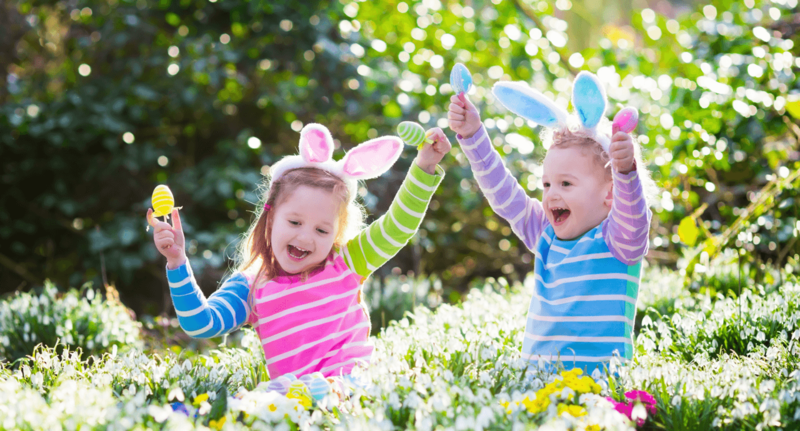 Especially depending on the ages and interests of your children, changing up your Easter egg hunt can be a great way to add excitement and maybe even build new traditions along the way.